Battlefields and Warriors: Version 5 Lock 'n Load Tactical, a first look. 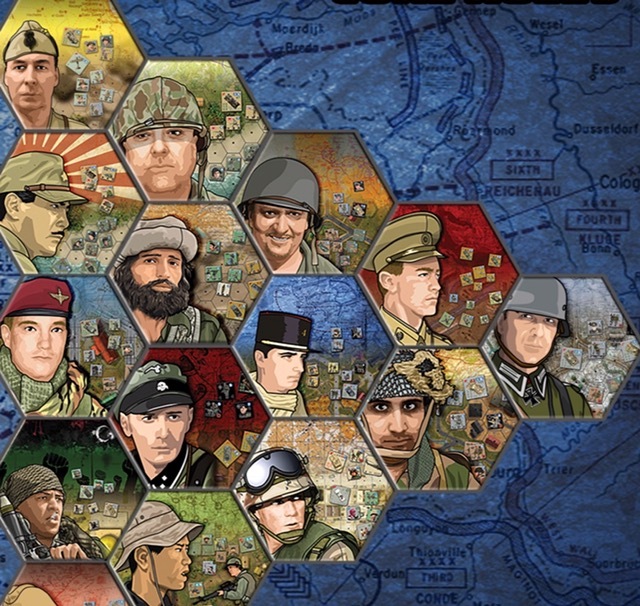 Lock ‘n Load Tactical is a boardgame covering WWII and modern combat at the tactical level, with counters representing individual squads, vehicles and support weapons. Hexes represent about 50 metres of ground. The system is already mature with a large selection of kit available and various theatres of war covered, making it popular amongst tactical gamers. The company have just updated the system core rules from version 4.1 to V5 and this post looks at the main areas of change and headlines some of the new rules. A jump from V4.1 to V5 suggests something of a fairly significant update, a thought reinforced by the substantial increased page count in these rules, but from the outset, it is worth stating that while rule presentation is much fuller and re-organised, this has been done to make the rules clearer and fans of the system will feel very comfortable as actual complexity has not increased and users of the V4.1 rules will be able to absorb the changes very easily. For the most part, I can see gamers generally being very pleased with the tweaks and new gamers pleased that the gateway to the system has probably been made easier for them. What is obvious when you spend some time with the rulebook is just what an amazing piece of work it actually is. To get something so well structured, explained and internally cross-referenced can only be down to real hard work and care and care and more care. Regardless of what is thought of the rules, this single aspect is absolutely striking. I say this partly with the knowledge that the Battle Generator and SOLO rules are also getting an edit, so the total amount of work done is impressive. Though significant reformatting of the rules and a merging of the WWII and Modern rule booklets (a return to how it was years ago) brings a noticeable increase in page count, the extra pages have been put to very good use to bring useful rule tweaks and plenty of extra clarity. This post is just going to work through some of that, giving some early observations on V5. Firstly - Why the increased page count? The very first thing that the player is going to note and wonder about is why the ruleset has grown so much. We have gone from V4.1 being 68 pages long to now being 244 pages in V5 (note - actual rules sit in pages 1 - 124). Yes, you read that right, but don’t worry, much of the additional volume is to do with re-organisation and much deeper explanations and it is worth saying again ..... the complexity of the game has not increased and users of V4.1 will be able to move into V5 without any effort, other than getting used to where things are now located, but even this is not an issue for reasons explained below. Once you start reading the rules, it will become quickly apparent that developer ethos has been to ensure that ambiguity is removed as much as possible and that design intent is absolutely clear. Sentences and in some case entire paragraphs have been added to provide better rule clarity throughout. It is often useful, will reduce debate, argument, doubt and Q&A and indeed, now that it exists, you wonder why some of it wasn’t there before. At times things may appear too wordy, as obvious things are stated, but I suppose what is obvious to one person is not to another and clarity is everything. For example, a new paragraph says that when a unit fires mortars indirectly, it cannot add its own Fire Power to the attack. It is an example however of just how thorough these rules have become (plus as followers of this blog will know by now, I am rather partial to the ‘wordy’ and 'complete' approach myself :-) ). Rules that were once spread around the rulebook have been brought together into single passages, such as there now being a single list of all those units classed as NME (non-melee eligible) or the various rules on single man counters (SMC) now likewise brought together. This includes references to the likes of nurses and advisors that instead of being described in detail in individual module rules, are now absorbed into the main body of the rules and appear in sections such as single man counters and the Rally rules. This knitting together of the various strands of the rules has no doubt been a big job, but looks successfully done. Importantly, the two rule sets that existed before (both to the standard V4.1) for WWII and Modern have been merged into a single set. For the most part this merging has no detrimental effect, as so much of the of the two periods share the same game engine, that the two rule sets had a lot of identical text. Where there are differences, they are obvious, so for example the gamer used to only a WWII module will see rules for things such as helicopters and ground-to-air weapons systems, but as mentioned later, you simply ignore those rule sections that don’t apply to whatever module you are playing at the moment. Developer notes have been inserted at various points as boxed text, to typically give insight into those rules that make you think ‘why did they do that’. They are shaded grey are easy to ignore once read. It is strange that L’nL Tactical never really had decent designer notes at the outset, but perhaps this is because the old company under the previous owners used a house magazine to include that sort of thing. There has been a migration of some of the module specific rules from the various expansion modules into V5. This alone is a fair bit of material. The idea will be that subsequent expansion modules will mainly just have national characteristic type rules. So for example instead of the PIAT rule being in Heroes of Normandy and then every other related future module that have late war British / Commonwealth, the PIAT rule now sits in the V5 rules. While these add bulk to the V5 rules, they have always existed and have been part of the learning curve. Of course, the reader, especially the new player getting into the system, will ignore those sections that are not relevant to the module they are using. So you would ignore entire sections such as cavalry, molotov cocktails, caves, Claymore mines etc if playing Heroes of Normandy, but would certainly want to read about British 2” mortars and PIAT’s. The front end of the book now has 7 pages given over to showing the counters and giving full descriptions of what the values on them mean, rather in the same way that V4.1 did with what now appears a rather inadequate single page (old page 4), only now the whole thing is very thorough and of course in full colour. The rear of the rules has a 5 page section that specifically covers ‘Additional Weapons and Equipment’ and these are a collection of weapons from the various modules, such as RPG-43 and Claymore mines etc, so some of these rules will be specifically used, depending on the module being played and the rest happily ignored and this is probably a sensible half-way-house to gather this collection of the more ‘unusual’ weapon types separately in the rulebook, away from the expansion module, but without over-burdening the player. The number of examples has increased. The old favourites are all still there, together with their illustrations, but here we now have additions of extra ‘text only’ example paragraphs that again underpin that ethos of wanting to ensure the rules are understood. In the melee section for instance, there are 9 such text examples. With the re-ordering of some rule sections, old hands may not find things where they ‘remember’ them being, but it’s not a problem as now we have a simply superb 24 page index. This really is a useful addition. You can go to a general heading such as Fire or Mines in the index and then from that heading, a sub-list will give all the various rules and pages that run off that heading. So under the general heading of Bunkers, there are 19 associated rules, such as Line of Sight, Mines, Melee etc, so whatever your query, it is a fairly easy route to track down the right rule section. This alone is significant play and learning aid. However the greatest learning aid comes at the end of the rulebook. Just like with V4.1 rules, there are two playthroughs, one for infantry and one for armour. The old ones were absolutely fine and did their job, but these new ones have had a HUGE facelift. We move from the 5 and 3 pages respectfully that V4.1 gave these subjects to a whopping 45 and 26 pages respectfully in the V5 set. Alone, this section is substantially responsible for the extra pages in this set, but it is a great piece of work. These are super detailed, going step by step through everything and so not only do they serve their ‘usual’ purpose, but these are good enough to be a full primer for anyone coming to the rules for the first time and equally important, anyone who has been away from the system for a few months who just wants a refresher. They also provide another source of examples for the player to refer to if they are unsure of any of the related rules. As a primer, a new player reading through them will have a much easier time when it comes to assimilating the main rules. Both playthroughs are cleverly woven so that a wide spectrum of the rules are covered and this is done in an easy conversational style. I don’t think there is anywhere else that I have seen an author work so hard to get a job like this done, especially as modern tactical warfare is such a potentially complicated arena for simulation. The infantry playthrough is a full 4 turn game based upon the starter kit. The Armour playthrough is an action packed 1 turn training playthrough that includes pieces from the starter kit and Heroes of Normandy. In addition to this, the air rules also have a small playthrough example each for fixed wing and helicopter actions. So collectively, these come together to make a superb way in to the game and for players to perpetually ‘keep their hand in’ and in truth are quite an enjoyable read. All of the significant rule additions / changes are easy to find as they are printed in blue ink (the same way that V4.1 handled new content). Text examples are give in red, so are easy to exclude once known. The font is very easy on the eye and together with the narrative style of writing, the gamer used to V4.1 presentation, will be at home with all of this. Finally, Lock ‘n Load have been building up a bank of explanatory videos, the resource page at the back of the rules has a text link for this ‘Bootcamp’ that can be copied and pasted, but in the true nature of these rules doing everything possible to smooth the way for the player, the section also has a printed QR code, so the user can just scan the code with their phone camera and they will automatically be taken to the video bank. In sum, the rulebook is bigger, more verbal, with better presented rules, but complexity of actual play remains the same as V4.1 players are used to. Some of the new paragraphs are there for completeness and perhaps should have always been there, such as the explanation of movement factors. Others show a depth of understanding of the nuances that surround the introduction of new rules. For example, with the new Assault Fire, units that are off-map cannot use AF as part of their impulse to enter the map. I thought that seem obvious at first, but then thought of situations in which players might have used the rule to fight their way onto the gameboard, so one is left with the sense that pretty much everything has been thought about in this re-write and that there has been a real drive and focus to get a tight ruleset, which they certainly seem to have done. An art to working with the new rulebook will be to know what not to read, so don’t look at stealth movement, cavalry or helicopters unless those rules are relevant to the module you are playing. The bottom line is worth saying again - more pages of help and explanation while complexity remains roughly the same. Secondly - What are the significant new rules? For those who had previously looked at the Beta Version, there is nothing of surprise here, but at last the guessing is over and we have the official set. Here a quick look at headline grabbing additions. Assault Fire - Some leg units units that have assault capability (movement factor is boxed in red) have always been able to Assault Move and the same is true of most vehicles, basically allowing a unit to move half it’s allowance and then immediately or in a later impulse, fire, but with penalties. Now these units can also Assault Fire, which is the same rule in reverse, you get to Fire with penalties and then use up to half movement allowance. Note though with AF, units must both Fire and Move in the same impulse, there is not an option to delay the movement or to use Assault Fire for opportunity fire. As an aside, this helps with the administration of the existing counter mix, since there obviously isn’t an Assault Fire counter and an Assault Firing unit can simply be marked with a Move counter at the end of its impulse. This seems to be an eminently sensible evolution of the rule. It does not add any new complication and opens the gamer’s options. It helps both sides as defenders can fire and then drop back, while the attacker can first try and shake an enemy with fire, which may then give it the freedom to move safely. Remember, Assault Fire only applies to Assault Move capable leg units and most vehicles, though note, non-assault capable units that start the impulse with the Assault Firing units can also add their Fire strength to the initial fire, they are simply given a Fire Marker and are left behind as the assault capable units move out. This will bring some interesting nuance to player options. Smoke - Before, in V4.1, infantry that attempted to lay smoke (usually needing a 1 or 2 on a D6) would be marked ‘Ops Complete’ regardless of whether it succeeded or not (meaning amongst other things, that it can’t then move) so to get the immediate benefit of using smoke, there often had to be other units available to move to take advantage of the smoke and the unit making smoke only had a 33% chance of doing so. All of this was a disincentive to use smoke, because you could generally find a better use for the squad that might attempt smoke creation. This rule has now been loosened, so that if the unit is successful in laying smoke, it is no longer marked Op’s Complete, but rather can move, but applying -1 to its movement allowance. Whether this will result in too much smoke hitting the table, only time will tell, but the rule suggests (optional) you can’t have more smoke markers in play than are physically available in that module. I have no idea just how much smoke troops in the various periods had available in real life, but I fancy we will now see more of it on the table anyway and players may have to introduce a usage brake other than counter availability if it gets out of hand. It just needs to be played to know what the overall effect will be, but at least we now have a tool that helps those attacks that have ground to a halt, to get going again, so overall a thumbs up for this change. Spotting - Buttoned up vehicles now have a capability to spot, but it has limitations, carrying a penalty when testing and they still don’t auto spot adjacent hexes. The loosening of this rule still highlights the advantages of having vehicle hatches open (or rather unbuttoned), but the game balance between open and closed turrets now feels much better and again we have something else that can help the attacker. In my own games, I have tended to keep turrets unbuttoned, even when it feels unrealistic to do so, so this will add some nice nuance - though remember buttoned vehicles still can’t auto spot adjacent hexes, which is a good brake on the rules change. Line of sight between buildings - There has been a loosening of the rule that prevented units shooting between two separate buildings, when the line of sight travels exactly down the hexside between the two said buildings ... (old page 30 in V4.1). The rules have always been quite clear about blocking terrain on either side of a hexside having the effect of blocking LOS, however, some gamers struggled with the notion that the rule was counter-intuitive to what the eye was actually seeing (i.e. a gap between buildings). I am guessing that this has been one of the most argued over rules within the team. Anyway, the outcome, like some of the other rules here, has been just a gentle loosening, that still keeps some restrictions in place and makes this situation a specific exception to line of sight rules, rather than opening up other opportunities with other terrain types. It also places spotting restrictions (penalties) on the target hex if that hex contains degrading or blocking terrain and units cannot exploit this gap for movement. So on balance, the rule has moved just enough to hopefully satisfy those that wanted it, while not bringing about contradictions within the system that some were concerned about. It embraces that there is a gap there, but that it is a tight gap that still presents problems real world problems. Helicopters - There are new helicopter v helicopter rules and these have been included in anticipation of future modules using them, so need no further explanation here. Well I think we are really only looking at one area of significance and this will no doubt be subject of ongoing comment by gamers. What are we talking about ....... Final Defensive Fire of course! Gamers that play a variety of tactical game systems will be familiar with some systems that say that even when a unit has been used / spent etc, if an enemy comes adjacent to it, it will always get a chance to make some final defensive fire. This has always been absent in L’nL tactical. The playtest Beta rules brought in a proposal that essentially gave a unit a chance (1 in 6) of getting off some final fire. Anyway, the bottom line is that this has not been adopted by V5. For my money, dropping it was the best outcome. Why? Well firstly L’nL is not one of the other systems! It was designed from the ground up to work without final fire. The absence forces players to properly set up effective crossfire and to keep some forces unused, so they always have something to respond with or to threaten enemy units that move up. It reflects the reality that a defence can be overwhelmed and that everything through the turn is happening at the same time, so to give a unit double firing would potentially undermine that. Adjacency is an important principle in the spotting rules and a unit moving adjacent does not always signal impending melee. In play, (in my opinion) attackers already have a tough job of it and a new final fire rule would stress existing scenarios as attackers work hard to take ground. Every scenario to date has been designed without it and many would no doubt be compromised by such a rule change to whatever degree. L’nL Tactical also has spotting, uncommon to most other systems and this already makes things tougher for the attacker, a Final Defensive Fire would instead just further shift the game to a defender advantage. The fact that the proposal itself only gave the fire a 1 in 6 chance of being available, reflects concern that this rule always had the potential to be too powerful within this system. In sum, I don’t think you can look at a Final Defensive Fire rule in isolation, because of the other influences going on in the game. While working through this rulebook, I put out a couple of scenarios from the Heroes of Normandy on the table (and plan to run my Dark July module off it next month). Out of interest, I replayed the Attack of Das Kochegschirr Scenario (Heroes of Normandy module). I played this a few times last month (on one replay I blogged an AAR - link below in the Resource Section) and thought it was too tough for the Germans (attacker), so I wanted to see in particular whether the new rule changes for smoke, Assault Fire and buttoned vehicles spotting would have any impact and help an attacker in particular. So here we go! Note - the rules say that a support weapon should be placed under the counter that possesses it, but in solo play, I just find it easier to keep it on top of a unit, so I remember where they are. Note - all photo examples in this post use the X-Map version of the map set, these larger hexed maps are bought separately from the module. The module maps are fine, I just prefer the bigger version for my banana fingers! Basically, the Germans enter the map from off-board and drive through a town to capture three buildings in the rear. The defenders are tough. In previous games, as the German player I have not been able to even penetrate the British forward defences. I set the British up exactly as I have done previously, with good crossfires and the ability to keep dropping back to new positions while maintaining crossfires. The Germans this time had a Panzer IV and a Marder out on the two flanks, but the StuG III and all the infantry roughly went for the centre. There are two important stacks. The StuG is doing co-ordinated movement with a couple of squads and Sgt. Baumann, while Lt. Koch has two assault capable squads and an MG34 with him. The vehicles enter the map with ‘open’ hatches, I want them to have the best chance of spotting the enemy hiding in the buildings. The vehicles Assault Move, so they move at half speed and then also fire, but with a penalty. The British get the initiative, so get the first impulse. They have a squad in the walled woods that has an acquisition marker on it from previous tank fire. The squad knows that it is getting too hot to hang around and they fall back, removing the acquisition marker since they change location. The Panzer IV fires shells at Sgt. Livingston’s position, wounding him. Together with his squad, he decides it is time to drop back and this tactic of falling back is frustrating for the German player. Sgt. Baumann with 2 squads wants to leave his building, cross the road and enter the walled wood, but that open road is dangerous, so let’s use smoke. One squad attempts to put down smoke (score 1 - 2 needed on D6), they fail so are marked Ops Complete. Next the second squad and leader attempt smoke, the pass and place the smoke counter. They can now move, but laying smoke costs them 1 point from their movement allowance. They step out into the smoke - another enemy squad fires at them from the flank but is ineffectual. They carry on moving and get into the woods, but their loss of one movement point prevents them from moving on into an enemy hex for close combat, still, that was a useful advance and under V4.1 rules, having failed with the first unit, I would not have attempted smoke with the second unit, as the unit attempting placement could not then move, so the smoke placement rule change has helped the attack here. The manoeuvre does not however have a happy ending as the British fire on the unit as it completes it’s move. The British rolled ‘6’ and the Germans rolled low ..... Oh Dear! The British get the initiative so wisely fire on the adjacent Baumann and his men. Devastating, but out of the mayhem, a German Hero (Asier) is generated and his presence will help protect the now shaken Baumann stack. This British unit also has a PIAT so is allowed to fire that at the same time. V5 allows the spring fired PIAT to fire from inside buildings, so that helps us here. The PIAT fires at the nearby Panzer IV. It needs a 4 or less on 2D6 to hit and it does! It strikes the turret, which is weaker than the hull. The attack value is 3, plus a D6 and the defence value is 3 plus a D6, so this will be decided just on the straight roll of a die - both sides hold their breath! One side sighs and the other cheers as the projectile fails to penetrate. That was a lot of nuanced action for a single impulse and typical of the enjoyable narrative that this system produces. Another lone German squad, not particularly well positioned to do much else this turn, attempts to thrown smoke into the street, so that Koch’s stack gets some safer movement opportunities when it activates. The attempt fails and unit is marked Ops Complete, but I am left wondering whether my swing from seldom using smoke, to now making full use of it is too much? The StuG buttons up and assault moves to get adjacent to Cpt. McCloud (stone building). In V5, buttoned units can now attempt to spot, but with a penalty and they can’t auto spot adjacent units, so here they must test ...... but first, a nearby PIAT armed half section with a skilled user, opportunity fires on the StuG. We get a hit, but no penetration or effect, the crew have nerves of steel. I want to check the rule for buttoned tanks spotting. The V5 index is very good, just look for 'Buttoned' and then scan down the short list for the sub-heading of ‘spotted’. That index really does help play. V5 says that buttoned up vehicles add +1 to spotting tests, so McCloud and his men in the building could only be spotted on a ‘1’. Hmm maybe not! Instead, the vehicle will go for the greater certainty that comes with firing on the neighbouring hex, containing the PIAT that just fired on the StuG, this will be auto spotted because of the Fire Marker, but they fail to hit. Stone buildings make for tough defences in L’nL Tactical, but at least the vehicle is buttoned up, so is safe from small arms fire. Looking at the situation of Koch with his two assault capable squads, makes me think about using the new Assault Fire rules that would allow the powerful Koch stack to fire with a penalty and then half move, but there are real problems for Koch. Firstly there are enemy units in two adjacent hexes across the road, if he dealt with one by firing, then as soon as he steps into the street, the other would likely devastate him, but of greater significance is that the Assault Fire rule, does not allow units to use Assault Fire and then enter close combat / melee, so using Assault Fire is of no benefit here, just good old fashioned straight forward firing would be the best thing to do. The Germans will not be able to make their victory objectives now, but they are doing better than they have in my previous runnings of this scenario. On the right Koch’s men lay smoke and move across the street. One of the squad goes ‘shaken’ as they are fired upon, but the other squad with its MG 34 gets into the stone building and wins a melee. The StuG has thrown open its hatches and it Assault Moves a short distance to become adjacent to a British squad in a building. The British squad is assault capable and it would be great if it could use the new Assault Fire rule to fire at the open turreted tank and then move backwards to take up a new position, but the rules do not allow Assault Fire to be used for Opportunity Fire, so the British unit must let the assaulting StuG III switch from movement to firing, to complete its Assault Move, without being interrupted (they could of course just fired normally due to the vehicle being unbuttoned - but there are other plans for this unit ..... if it survives!). Turn 7 (last turn of the scenario). The Germans have done better than previous attempts in this scenario. The British mid-line is about to crumble, but the last phase of the scenario requires three buildings in the British rear to be captured and the Germans do not have the time or enough unshaken units to do that. Overall this scenario continues to feel unbalanced to me, but on this occasion, the new smoke rules have helped the attack maintain momentum, while the new Assault Fire and Buttoned up spotting rules have played their part in giving more player options to consider during play. Conclusions - The rules update has been a significant piece of work by the company and those supporters who offer their invaluable time (thank you). The additional material and ethos of taking every opportunity to fully explain the system is welcome. The result is more pages, but it has been done without an increase in rules overhead compared to the totality of v4.1, so the game complexity essentially remains roughly the same and it has to be hoped that gamers feel the increase in verbiage leads to an easier management of the rules and an easier access point for the new player. The extra tactical options will require a slight change in playing styles and mindset as players make use of their new Smoke, Assault Fire, Fire between buildings and buttoned up spotting rules. The combination of new rules being printed in blue text and a really good new index will help players get a firm handle on this set, as will the extensive playthroughs in particular, plus the video supported Bootcamp footage. As a mature system, Lock ‘n Load tactical offers a rich gaming environment that at present takes us from 1939 to 1985 in 8 core modules (plus 1979-‘89 Soviet-Afghan War, Oct 1993 Blackhawk down and 2011 Libya) and you can collect all or just the parts that interest you and if the latter, then there are areas of the rule book that you can simply ignore. It is particularly important that new gamers to the system understand that they can simply pass on the rule sections that do not pertain to their game. The walkthroughs are pretty exceptional and I can see regular players repeatedly visiting them as they dip in and out of the series for short periods and just need a quick primer to get back into the swing of things. My only reservation at this point is whether smoke is now too readily reached for. I really don’t know how available it was on the battlefield, but if it becomes an issue, I think I might try a house rule in which at the start of play, a side gets an allowance of smoke counters equal to their smoke creation capability, so in the above game, that would have meant that the Germans would only ever have been able to put two smoke counters into play and would have needed to be more thoughtful about it. Importantly, in competitive play, that might stop a defender with spare capacity using units to create smoke in a useless hex, simply to keep the counter mix exhausted and deny or at least limit their enemy access to smoke creation (though I despise that sort of gamey play, it is a consideration for rule writers to negate). There are going to be two main audiences for V5. Those who come from V4.1 will find the transition easy and the extra explanations helpful and those who are coming to the game for the first time. The latter group on the one hand may feel the expanse of the rules initially look intimidating, but it has to be hoped that this particular audience will find the better rule structure, good examples and perhaps most importantly the excellent playthroughs, a useful counter-balance that will actually get them up and running faster. This has been no mean under-taking by the company and is especially impressive as this update work has also included a separate re-visiting of the Scenario Generator and SOLO systems for gentle improvement in their rule presentations. If a fan base ever wanted to see full commitment to a series system by the producers, the work and effort that has gone into version 5, gives that by the bucket load. An earlier article that looks at how the gun / armour relationship plays out. Recent replay of the Attack of Das Kochegschirr scenario from Heroes of Normandy. Norm, another well-presented overview/review of the latest version of LnL. With each entry from you, I grow more and more interested in this system. I like enjoy clarity in rules' writing too. If that necessitates a more verbose edition, so be it. Are you in the rules' writing camp of case study by "exclusion" or "inclusion?" Thank you for making the effort to provide such useful information. Quite right about clarity coming from FtF play. Sometimes that seem perfectly clear to me are contrary to another's interpretation. Being an inclusionist, unless an action is specifically excluded, it is fair game, right? Thanks for the thumbs up, now that the rules are fully fresh in my head, I will press on and do the Dark July module next. Thanks for a very comprehensive review Norm:). If time permitted, this is one boardgame that interests me, but at present time is one thing I'm short of on the gaming front. Thanks for doing this. As I am a sucker for WW2 tactical games, of course I have some LNL, but have only dabbled. I need to work out a cost-effective way of getting the solo system, never mind the new rulebook. Thanks Ellis, it will be interesting to see what the company announce over the next few days re product and cost, as they need to introduce new versions of rules, SOLO and Battle Generator to an audience that already have some of this, so maybe some encouraging offers deals will follow. Great job mate. Thanks for the great walk thru. Thanks for the thumbs up, glad you enjoyed it. Thanks for your work on this, Norm. I hope that LnL will release the V5 rules very soon. I just ordered the starter kit last week & it is due to arrive in a few days, so I'm just about to get started. I feel that the low success rate for laying smoke plus the movement penalty will make people think twice about trying to use it at every opportunity. Thanks Clay, I still think V4.1 rules have value as they are short to get into and to and any unlearning to move to V5 is neither here nor there. The starter kit is a great way to test the water. Yes, in the module I was playing, there is still only a 33% chance of getting smoke, so a greater chance of just going Ops Complete and if things are tight, a gamer may not want to take a ;chance' on creating smoke, though going Ops Complete still allows the unit to opportunity fire (with penalty), so again, another nuance for decision making. If you are simply stuck as the attacker in a stalemate, then the new smoke rule can be a good way to rescue the scenario and get things moving again and would be worth the chances of failure to do that. While I do not have the boardgame, this is a good read and first rate review (or detail overview) with one or two ideas which can get reused. Thanks. Thanks Peter, glad you enjoyed and that you could see parallels with what is on your table. Sounds like a nice clear system, clarity is worth a lot! Thanks Iain, one of the things that stuck me was that when you look at the type of Q&A that crops up say at BoardGameGeek, some of it relates to rule gaps that need to be filled, others is just really players looking for confirmation that they are doing it right. V5 is addressing both those audiences by its completeness. I think the folks and Lock N Load need to be sending you a little thank you note, Norm! Very nice write up for a game system. I was not familiar with this rule system at the start of the post, but now I feel that I am! 😀. Your enthusiasm shines through as genuine and infectious. While I can’t comment on the rules: Clarity and organization in a rule system is often undervalued by readers. It’s nice to hear that it’s being prioritized. Thanks Stew, it has left me with a lot of respect for the huge effort put in by those closely supporting the game. I know how tiring it can get to get that last 10% right, so people close to the company have given fully of themselves to this - well done all. Panzer Grenadier includes a rule that says eligible units (and OBA) can each fire smoke a number of times equal to scenario length divided by 10 (fractions rounded up). Maybe use something similar for LnL Tactical, except dividing by 4 or 5 instead of 10. L'nL typically have games lasting 7 turns. In my most recent game, I rolled plenty of times for smoke, but the dice were cruel and I didn't get any, but the troops that attempted the roll obviously then went 'Ops Complete', so I think there will be games with plenty of smoke and some with none! and hopefully shades between those two extremes. I think I will end up implementing a cap of some sort, but would really like to better understand what the typical smoke laying capacity of a two platoon type force typically was, say, mid-war. Panzer Grenadier has some very long scenarios, but that formula does sound useful for spreading use over time to get a capacity.